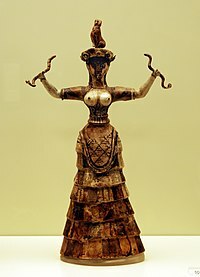 the island of Pseira, off the coast of Crete, has an archaeological history from the end of the Neolithic to the Late Bronze Age, with Minoan ruins being the most studied? the Minoan Bull-leaper is the only known complete sculpture depicting Minoan bull leaping? Salvia fruticosa or Greek sage (pictured) was depicted on a 1400-BCE Minoan fresco on the island of Crete, and is still grown and used widely today? Question 1: The Minoan trade in saffron, the stigma of a mutated crocus which originated in the Aegean basin as a natural chromosome mutation, has left fewer material remains: a fresco of saffron-gatherers at ________ is well-known. Question 2: If the values of these Egyptian names are accurate, then this ________ did not privilege LMIII Knossos above the other states in the region. Question 3: The palaces were often multi-storied, with interior and exterior staircases, light wells, massive ________, storage magazines and courtyards. Question 4: The ________ occurred during a mature phase of the LM IA period. Question 5: Streets were drained and water and sewer facilities were available to the upper class, through ________ pipes. Question 6: During LMIIIA:1, ________ at Kom el-Hatan took note of k-f-t-w (Kaftor) as one of the "Secret Lands of the North of Asia". Question 8: LMIB ware has been found in ________ under the reigns of Hatshepsut and Tuthmosis III. Question 10: Minoans were traders, and their cultural contacts reached far beyond the island of Crete — to Old Kingdom Egypt, to copper-bearing Cyprus, ________, and the Levantine coasts beyond, and to Anatolia.